Are you looking for a wonderful cover letter format for Virtual Assistant to impress your client? Yes, we are here to help you in these regards. You will find a lot of hidden tips and the rules of writing a cover letter for Virtual Assistant here. So, keep with us to have a clear concept about Virtual Assistant (VA) and the writing tips of a killer Cover Letter for it. We will provide two types of cover letter sample. One for Upwork and freelancing platform and another one is for individual organization. I request you to read till the end and you may also download Upwork overview sample. First of all, why you should be so conscious of writing a standard cover letter. Your cover letter is the most important thing to draw your client’s attention. Your recruiter won’t see you, or your resume, or any of your previous works at first. Your cover letter is the thing that your recruiter will judge first. So, now you understand your cover letter will make your first impression to your clients. That is why you should create it in such a way that it may work like a bridge to you and your expected position. Some people start writing a cover letter without even knowing about Virtual Assistant properly. Eventually they fail to get their desired job. It is must for you to know what VA or Virtual Assistant is and what type of work they do before writing a cover letter for Virtual Assistant. So, let’s get some knowledge about Virtual Assistant before starting with the cover letter. Time management and deadline orientation etc. Now you know what The Virtual Assistant is and what type of job they actually do. So, let’s proceed on with the cover letter for Virtual Assistant. Here are some tips to write a good, standard and effective cover letter to draw your reader’s attention that will help you to reach your ambition. Research your client: Before starting to write your cover letter read through the job post carefully and make research of your client. Find out the skill and efficiency that your client is looking for in the employee. It will help you understand what your client exactly needs from you. And convince your reader in your cover letter that you are the only person that your client needs for his work. Formatting: Your cover letter must be formatted in a standard way. Generally, a good cover letter consists of three things- a polite salutation followed by a nice introduction, a chronological representation of you and an optimistic ending with your signature. So, try to maintain this format while writing a cover letter. Header: Mention your full name along with your contact number and address in the header in a smart way. Introductory Paragraph: In the introductory paragraph clearly mention your purpose of writing that is your job title with reference of the job post. And then introduce yourself to your client with your educational and professional qualifications. Development: In the next paragraph develop your logics in a proper way why you are suitable for the post. Highlight your experience and confidence of the work. Make your reader believe that you love and enjoy your job as virtual assistant whole-heartedly. Concluding Paragraph: In the concluding paragraph show your optimistic view and explain your availability and make an end with the hope of next contact. And make it followed by your signature. This is the genuine way how to write a standard cover letter for Virtual Assistant. 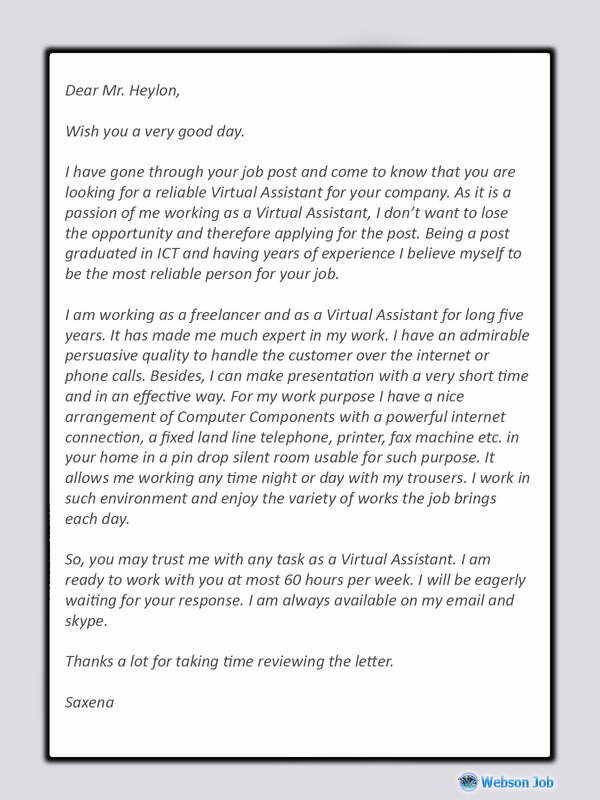 If still you are in confusion and face any problem writing a killer cover letter, look over the following sample of an amazing cover letter written for the post of Virtual Assistant. You’ll surely be able to write a standard cover letter yourself. And hopefully you will take you to your goal. All the best wishes for you. I have gone through your job post and come to know that you are looking for a reliable Virtual Assistant for your company. As it is a passion of me working as a Virtual Assistant, I don’t want to lose the opportunity and therefore applying for the post. Being a post graduated in ICT and having years of experience I believe myself to be the most reliable person for your job. I am working as a freelancer and as a Virtual Assistant for long five years. It has made me much expert in my work. I have an admirable persuasive quality to handle the customer over the internet or phone calls. Besides, I can make presentation with a very short time and in an effective way. For my work purpose I have a nice arrangement of Computer Components with a powerful internet connection, a fixed land line telephone, printer, fax machine etc. in your home in a pin drop silent room usable for such purpose. It allows me working any time night or day with my trousers. I work in such environment and enjoy the variety of works the job brings each day. So, you may trust me with any task as a Virtual Assistant. I am ready to work with you at most 60 hours per week. I will be eagerly waiting for your response. I am always available on my email and skype. Thanks a lot for taking time reviewing the letter. In order to write a cover letter in response to your client’s job posting, you have to follow some traditional rules. This is not mandatory but showing respect is always golden. Let’s do that.